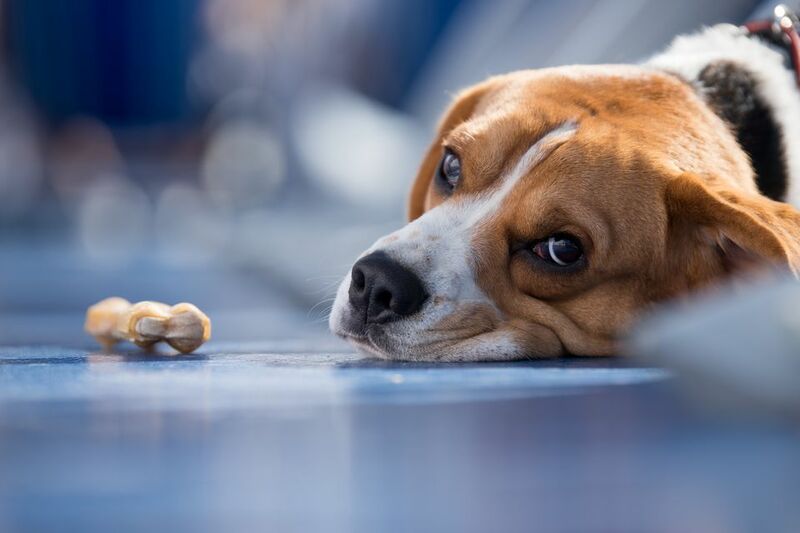 What Should I Do If My Dog Is Poisoned? Every dog owner needs to know what to do if a dog has been exposed to poison. There are many kinds of toxic substances that a dog can come into contact with. If you think your dog has been exposed to a poison or toxic substance, it is important that you act quickly. If possible, take time in advance (before it's an emergency) to learn what you should do if your dog is poisoned. First, try to identify the toxin and how your dog came into contact with it. Was it eaten, inhaled or absorbed through the skin? Was it a poisonous plant? Could it have been a harmful food? An animal such as a toad? Was it a toxic chemical? Try to determine how much of the toxin your dog ate, inhaled, or otherwise came into contact with. Obtain the original packaging of the toxin (if applicable). You may be advised to rush your dog to the nearest open veterinary clinic. Get there quickly, but be safe! Remember to bring the packaging of the toxin if applicable as well as your dog's medical records if he will be new to this vet clinic. A professional may ask you to induce vomiting at home with hydrogen peroxide. For this reason, you should try to always keep an unopened, non-expired bottle of hydrogen peroxide in your home (old hydrogen peroxide will not usually work). You will give the hydrogen peroxide to your dog by mouth. The veterinary professional will tell you how much to give. NOTE: Never do this unless advised to do so by a veterinary professional. It is not always safe to induce vomiting! If your dog's skin or coat came into contact with a toxin, you may be advised to bathe him. A professional may recommend normal dog shampoo or something stronger. In some cases, a grease-cutting cleanser works best. Try to keep some Dawn dish soap around, as a professional may recommend you bathe your dog with it. It is a good idea to keep your dog’s medical records, identification (such as a microchip or tattoo) and other important items in an accessible area in case you have to go to a new veterinary clinic. Also, make sure your dog wears a collar with an ID tag or keep it near the door ​(with a leash) so they are easy to grab on the way out. In general, you should contact a veterinary clinic if your dog shows any signs of illness, even if you don't suspect poisoning. The symptoms of toxicity may not appear for hours to days. Signs may be vague, such as lethargy or poor appetite. Signs of toxicity may also be more extreme, such as seizure, collapse or trouble breathing. Do everything you can to prevent toxin exposure in the first place. Keep dangerous items out of your dog's reach (this includes your garbage). Try to use products in your home and yard that are known to be safe for pets. Take care not to drop potentially harmful food items while cooking. Choose pet-safe plants and flowers for your home and yard. Prevention is the best thing you can do to protect your dog. However, poisoning can still occur, no matter how careful you are. Fortunately, you now know what to do just in case your dog is poisoned.